Warning: Reading this may stem the tide of mass extinction. At least, that's the idea behind graphic warning labels proposed for gas stations across North America. 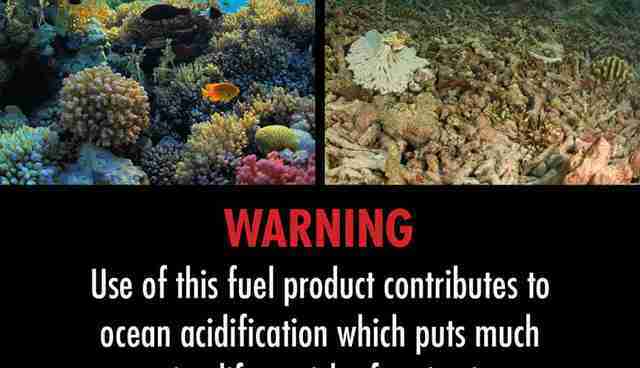 Think of it as a cigarette warning label for fossil fuels: Just as those gory labels promise that you're doing a world of harm to your body, so too do gas pump warnings promise you're doing irreparable harm to the planet. Fossil fuels, particularly petroleum, have long been singled out for their starring role in the last end-of-the-world movie we'll ever see. 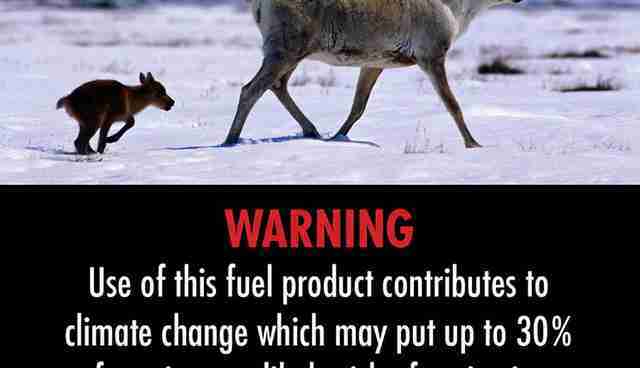 The hunt for that fuel has imperiled countless species of wildlife. Burning it has choked out entire ecosystems. And yet we love 'em! The United States alone gets 84 per cent of its energy from this terrible trifecta of oil, coal and natural gas. Trouble is we've heard this song so many times. Which is why the Canadian organization that developed the labels thinks it's time to pump up the volume. "The act of gassing up has become a habitual, automatic behavior," Robert Shirkey, executive director of Our Horizon tells The Dodo. "It's been completely normalized for a couple of generations." Shirkey's nonprofit organization is dedicated to changing that. "The labels take this automatic behavior and disrupt it. In prompting the question, 'Well, what am I supposed to do? If not this, then what?' "They frustrate the status quo. It's a simple, low-cost tool to de-normalize fossil fuel consumption and create a social environment that's ripe for reform." The idea is gaining momentum, with several Canadian city councils - in North Vancouver, West Vancouver and Port Moody - expressing support for the labels. "The game plan," Shirkey explains, "is to take these examples of political leadership and send a massive email to share it with thousands of politicians all over the world." The trouble is those pumps happen to be prime advertising space for gas stations. Understandably, not all vendors are on board with advertising the armageddon rather than, say chocolate bars or super-cheap bottled water or those thingies that make your car smell awesome. Besides, we know we're drowning in our fossil fuels already, right? "It's not like the connection between fossil fuels and carbon isn't already known," Andrew Klukas of the Western Convenience Stores Association, told the Vancouver Sun. 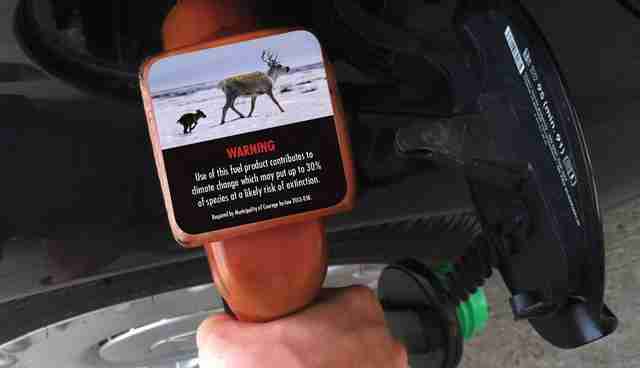 "What difference it is going to make having some downer picture on a gas pump? I don't think it's going to be effective. It's just annoying." Hmmm ... Extinction. Gatorade. Extinction. Gatorade. GATORADE! Let's all raise a glass to the thirst to come. Or, of course, we could get behind this idea. If you would like to join the movement to make this a global concern, click here.